Ravens are seen as tricksters in many traditions. But Common Ravens have a softer side. 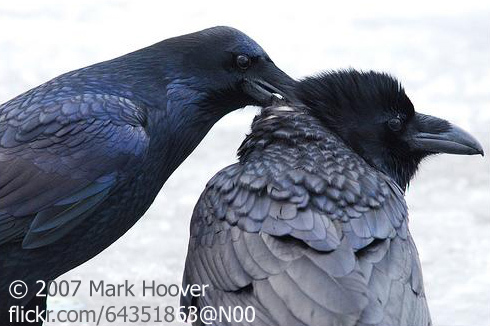 During courtship, a pair will often sit side by side, sometimes preening each other's feathers. And during that ritual, one or both may make soft warbling sounds. Raven nestlings sometimes make this same sound after they've been fed. Compared to the usual raucous raven calls, this one is soothing. It's called a comfort sound. You can hear more raven songs at macaulaylibrary.org. Call of the Common Raven provided by The Macaulay Library at the Cornell Lab of Ornithology, Ithaca, New York. Warbling song of the Common Raven recorded by W.W.H. Gunn. Raven calls recorded by G.A. Keller. One happy raven in the snow.